Prime Minister Narendra Modi on Monday congratulated Centrist candidate Emmanuel Macron after he was declared winner in the French Presidential election runoff. 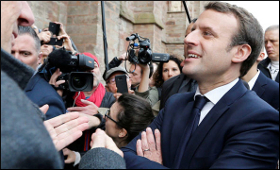 Centrist candidate Emmanuel Macron was declared victor after he won 20.7 million votes, firmly beating Marine Le Pen, who took about 10.6 million in the French Presidential elections' crucial runoff on Sunday. According to the official results announced, Macron wins 66.06 per cent of total votes. Le Pen got 33.94 per cent of the votes, BBC quoted the French Interior Ministry as saying. The turnout in this runoff was nearly 74 per cent -- the lowest in almost 50 years. French media reported that Macron supporters came out on the streets in celebration while Le Pen called him up to congratulate him.